have many rechargeable flashlights to choose from. 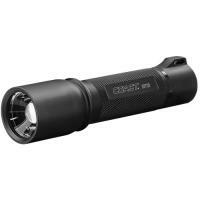 The Coast HP7R is a versatile law enforcement flashlight that packs a lot of power into a lightweight aluminum body. At full power, its LED is capable of outputting 300 lumens. The light features Coast's Long Range Optic System with slide focus technology. This allows you to adjust the beam from a tight, long-distance spot to a wide-angle flood quickly and easily. A simple twist mechanism makes it easy to lock once you have the right angle. High and low power settings allow you to adapt to different lighting environments, and it also comes with a strobe mode for dazzling suspects. The flashlight also features the Flex Charge Dual Power system, which allows it to use either the included lithium-ion pack or standard AAA batteries. It is also micro-USB rechargeable, so you can recharge it in almost any location. Its durable aluminum casing features a knurled texture for a secure grip, and also delivers both impact and weather resistance for use in outdoor conditions.